Exclusive to Tower Hamlets' Library and Idea Store Members! Head down to your local centre for cinema and live arts, to see a film for £6. 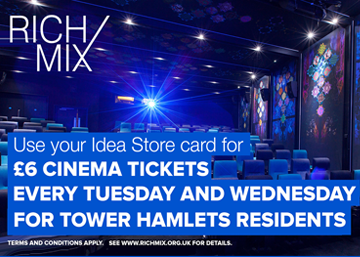 Rich Mix is pleased to be working with Tower Hamlets Council to exclusively offer library and Idea Store members films for just £6 every Tuesday and Wednesday. Film tickets can be booked online, over the phone or in person at the Rich Mix box office. Just show your library or Idea Store card and a form of identification when collecting tickets at the box office. For more information and to purchase tickets visit the Rich Mix website or call 020 7613 7498.